Road trip in a land of stunning views where English isn't spoken. Despite the remoteness of the Altai region and its distance from Russia’s capitals, many foreigners come here. The mountains, lakes, woods and deserts of the Altai Republic and the Altai Territory make a spectacular destination. Here, on the borders of Mongolia and Kazakhstan are the relics of old shamanic religions and prehistoric rock-carvings above meadows full of flowers. There are opportunities for rafting, hiking, mountain climbing and sleeping in traditional yurts. Here are a few tips on how to blend in when traveling to one of the most exotic regions of Russia. The best option to reach the Altai Mountains is to take a direct flight from Moscow to the Altai Republic’s capital, Gorno-Altaysk (3,800 kilometers east of Moscow). Then you can rent a car or book a tour, and drive south along the Chuysky trakt toward the Mongolian border. There are also many flights to Barnaul, capital of the neighboring Altai Territory, and which is bigger and more developed than Gorno-Altaysk. Here, it's easier to rent a car and make the three-hour ride to Gorno-Altaysk. If you decide to rent a car instead of buying a tour, take a crossover or a jeep; prices start from $85 (5,000 rubles) per day. Although the Chuysky trakt is very good, there are places like Lake Teletskoye where you need to get off the main road and you should be prepared for bumpy off-road driving, as well as extra trouble when it rains and the road turns to mud. The main advantage of exploring Altai by car is that you can take your tent and pick any camping place along the highway. If you are not a fan of camping, then book a hotel room beforehand. Mind you, it’s hard to book anything last minute during high season (June-August), so do it 2-3 months in advance. The Chuysky trakt, which meanders along for about 1,000 kilometers, starts in Novosibirsk and extends across the Altai Territory and the Altai Republic down to Russia’s border with Mongolia. The northern route of the Great Silk road began here in the 3rd millennium BC. Chyusky is Altai’s main and most beautiful road. Along it, you'll see small villages and mountain landscapes, and then after Mt. Belukha’s snow-capped peaks the real steppe begins. Many interesting places like Kalbak-Tash, the Chike-Taman pass lookout, and the lookout over the confluence of the Chuya and Katun rivers are marked by special brown signs in Russian and in English. Follow the signs along the Chuysky trakt and be ready to take some of the best travel pictures of your life. 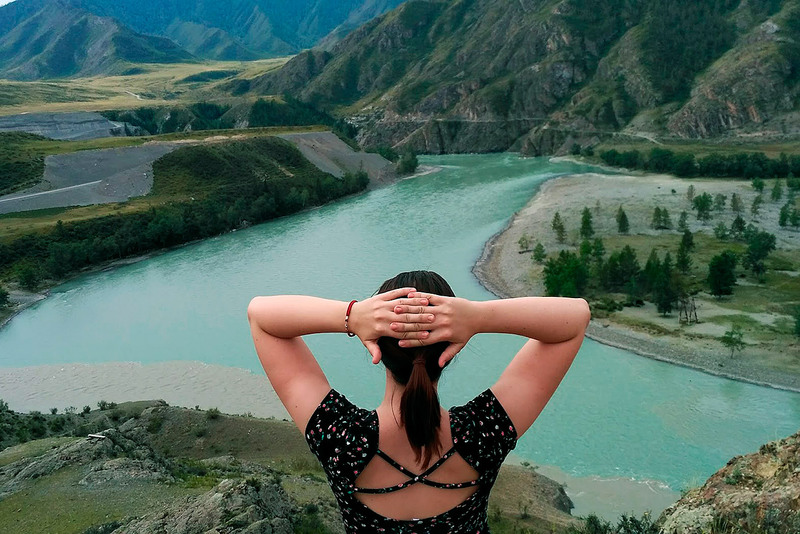 The majority of services in Altai are only in Russian, and you'll need a local friend, an English-speaking guide or an interpreter to rent a car. Also you may take a local tour, or go river rafting down the Katun or Chuya rivers. There are a lot of boat trips on Lake Teletskoye, or short tours at Kalbak-Tash with its ancient petroglyphs, which are very much worth seeing, but you’ll need a translator. The farther you travel into Altai, the less English speakers and pesky tourists you'll meet. Often only hand gestures can help communicate in these remote regions, but less talking can improve your travel experience in Altai. For example, you can listen to the traditional wandering storytellers, kaichi, who can perform for hours, or enjoy the stunning cosmic silence under the Milky Way in the steppe. Due to the fact that Altai is a wild land far away from civilization, it’s pretty impossible to find a modern toilet. Prepare for outhouses with holes in the floor instead of a ceramic toilet bowl. Paper towels and hot water also won’t be found. The good news, however, is that the deeper you ride into the Altai Mountains the more likely you'll find the purest water springs or even small waterfalls from melted glaciers. Altai has strong culinary traditions, and local inhabitants have long been livestock herders who know much about cooking meats and holding feasts for family and travelers alike. Local residents put the best they have on the table, even if their guest is a random foreign traveler who doesn't speak their language. Refusing to join in the feast or to drink traditional kumis is bad manners, so prepare your stomach to feast on mutton, homemade cheese, mare's milk, and golden-brown baursaki donuts. Add to your Altai to-do list a visit to small local museums. You'll find not only interesting artifacts but also interesting people. The heirs to Altai’s various cultures – Kazakhs, Telengits, Altaians, nomads and Russians – sometimes have family museums in their own yurts or houses and are pleased to show and tell about their most precious treasures from the past - traditional costumes, saddles decorated with silver by the hands of their ancestors, kites and stories for training golden eagles, vintage family photos and much more. In gratitude for the local hospitality, be it a shared meal or an interesting tour, you can always offer a small souvenir from your country which fits easily into your pocket or backpack – maybe postcards or snacks, or even more useful presents for people who work hard in the open air. Pleasant memories can be the best travel gift; chances are that you’ll meet again in Altai and might need each other. Kazakh rugs with ethnic prints, traditional musical instruments or the secret ingredient for a nomadic tea or dessert can be good souvenirs to bring home from Altai.